The Landscape enhancement and maintenance Crew Leader must have a great work ethic and desire to grow in the green industry. We provide an excellent opportunity for employees to grow personally and grow in the company. There is opportunity to make a lifelong career at Roark landscaping. This is an eleven-month, tenure track, 75% teaching and 25% extension position in the Horticulture and Landscape Architecture Department at Oklahoma State University. Preferred start date is August 2019. This position focuses on small scale food crop production. Applicants must have the following: a Ph.D. (by the time of hire) in Horticulture or a related field with an emphasis on food crop production; a passion for teaching and student mentoring; willingness to develop a nationally recognized small acreage food crops production extension programming effort; an appreciation for teamwork and interdisciplinary collaboration; and excellent interpersonal, communication, and computer skills. Responsible for the management of the OSU Campus Urban Forest, reporting to the Manager of Landscape Services Installation. Duties include urban forest management, tree protection coordination, and community educational forestry efforts. Bachelor of Science in Forestry, Arboriculture or related field. Three years of work experience in a related field or equivalent combination of education and experience. Knowledge of plant id, proper planting, pruning, pest management and tree protection is imperative. Duties include; Maintaining lawns, multiple lawn irrigation systems, tree care, inground swimming pool, wildlife feeders, dwelling, barn and fence located on absentee owner’s private grounds. Also, some general repair & maintenance, ground keeping, and handyman projects would be required on other dwellings, barns and grounds located throughout the acreage. Would also be required to maintain equipment pertaining to these duties. Sooner Plant Farm, located in Northeast Oklahoma, is needing to add additional team members to help continue growing their well-established online plant business. Several immediate full-time positions are available in their office, shipping department and field production. Sooner Plant Farm is looking for applicants with experience in any of the following areas: landscaping, landscape plant knowledge, social media and internet marketing, Microsoft Excel or Access, website development, customer service, small package shipping, plant growing or nursery management. The Horticulture Manager is responsible for overseeing all aspects of inventory production and maintenance at the Center of Family Love greenhouse, retail facility and community garden. This role also communicates with the Director on growing strategy and inventory needs, and provides plant training to all retail staff, job coaches and individuals with developmental disabilities. The Horticulture Manager also ensures that retail centers are fully stocked with seasonal inventory, ready for special events and assist with customer requests. ONLA Members are in the news! ​ ​When you’ve been-there-done-that time and again, keeping things novel can pose a challenge. Southwood, one of Oklahoma’s largest grower-retailers with 35-plus years’ experience behind its name, doesn’t see this type of problem as an obstacle — it’s a mission. 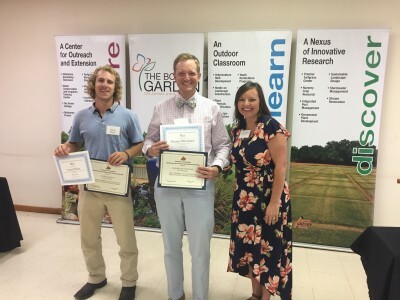 ONLA is thrilled to support Oklahoma's up-and-coming Horticulture and Landscape Architecture stars! OSU-Stillwater students are nominated by faculty members and chosen during the April board of directors meeting. OSU-OKC students may apply directly to ONLA for the scholarship. The deadline for applications is June 30th, as the recipient is chosen during the July board of directors meeting. Please complete the application packet, which can be found here . Congratulations to the The 2018 ONLA Scholarship recipients from OSU-Stillwater, Darren Blanchard and Sam Ryan. Darren will be graduating in the Fall of 2018 with a degree in Horticulture Science , Sam is pursuing a degree in Horticulture Business and will graduate in the Fall of 2019. 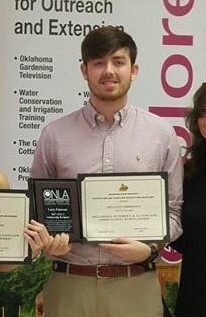 The 2018 ONLA Scholarship recipient from OSU-OKC is Sarah Porter. Sarah is studying Horticulture with an emphasis in Nursery and Greenhouse Production. Congratulations to Aaron Pierce, the recipient of the Jim Sanders Memorial Horticulture Scholarship for 2018. Seed money for the scholarship was raised by a spur-of-the-moment bid on our auctioneer’s hat in Jim’s name during the annual live auction. The ONLA Board of Directors shortly thereafter voted to set aside this seed money to start a scholarship in Jim’s name. The Sanders Family chooses the recipent of the Jim Sanders Memorial Horticulture Scholarship. This honor will be awarded to one (1) undergraduate student enrolled for the Fall Semester at Oklahoma State University. The student must be working toward an undergraduate degree in the area of Horticulture and be currently maintaining a minimum grade point average of 2.75. The student may be classified as a part-time or full-time student. Recipients are announced at the Oklahoma Grows Conference + Trade Show. Download the application for the Jim Sanders Memorial Horticulture Scholarship here . of Oklahoma's Green Industry and beyond. Special editions are distributed when timely notices are necessary. Past newsletters can be viewed on ONLA's Facebook and Twitter pages. Please follow us!